When a band makes it as far as a third album, two of the many possible responses are universal: the achievement speaks volumes, and we have a pretty good preconception of what we're about to hear. But then, sometimes, a band (particularly The Cattlestops) will deliver something a little different than expected, without being unrecognisable as the group we know and love. The Cattlestops now have three CDs, no two interchangeable with each other. To me, all are essential Aotearoa classics. When an album is birthed, the focus is on who is delivering the songs. As time goes by (play it again, Sam) it's the songs themselves that keep us listening to the set. "Dance In The Rain" has all the hallmarks of longevity. As expected, it's all about the boys trademark version of Contemporary Kiwiana, woven from such as country, folk, acoustic blues, and swing. This time it's pretty much a showcase for James Cameron as singer-songwriter in a full-band setting. And a heartfelt "Thank You James" from me for your admirable, personally-based compositions with real storytelling and melodic melodies. Eight songs by James, two by Andrew London, and one collaboration. A road-ready repertoire. If you're wondering whether this album is for you, just the fact that it's The Cattlestops should be sufficient seduction. On the performance and production sides, it ticks all the quality boxes -- bigly. Ditto for the compositions, several of which should already be considered as part of the Great New Zealand Songbook. My broadcast of James' "Martinborough Morning" generated more feedback than anything else I've featured all year. Instant classic! If I have the disc anywhere near a CD player, I simply have to purloin a minute or two to be recharged by Andrew's "Look Out For Number One". Timeless! This is one of those rare NZ albums which is both addictive and, from beginning to end, the great variety of songs and stylings flow like a pristine rural stream. 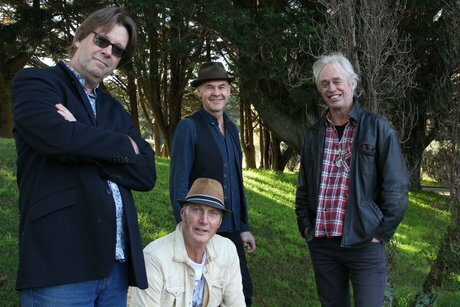 More dad rock (possibly even granddad) because these senior players have accumulated decades of playing and they've been the Cattlestops from the Kapiti Coast since 2005. Alongside longtime members writer-bassist-singer James Cameron and guitarist-writer-singer Andrew London are now keyboard player Wayne (Fourmyula) Mason, steel guitarist Ross McDermott and drummer Lance Phillips (and some guests). With a comfortable country flavour (Cameron sometimes sounds like Billy Joel raised rurally), economic songwriting which offer reflections on love and the passage of life viewed from the far end, this has reference points in Amazing Rhythm Aces, alt.country and smart pop ballads. It flows easy on the ear and has something to say about families separated by distance, loss and enjoying the moment. They bring in some swamp-rock on the groove-riding West Coast Sunsets, but -- like Mullins – locate themselves geographically and emotionally in this country. And the title track celebrates good times here and now rather than waiting for them to come. The Cattlestops new CD Dance in the Rain is an uplifting, enjoyable experience. This is a well-produced, mastered and engineered piece with excellent sound balance and an intimate feel .There is a nice mix of catchy tunes and easily memorised lyrics .There are good voices and instrumental parts with some great guitar riffs, drums and percussion, piano and organ accompaniment plus an interesting use of the double bass and violin. The melodies are very good and original with some clever key changes here and there which are very pleasing to the ear. The songs are well constructed and many of them are really quite poetic. A great contrast in vocals is provided by Andrew London whose gritty, almost gravelly at times, bar room voice adds a pleasing counterbalance .He comes into his own on the songs with an ironic twist (e.g. Looking out for number one and Down to the River – not so ironic -.) He plays a mean guitar and you can hear the smile on his face when he sings and plays. Andrew has a well -honed sense of rhythm which is matched by the drummer and percussionist Lance Philip. The other guitarist Nick Granville ,who plays on 4 tracks, is obviously a true professional as demonstrated by his tight riffs (sounds funny as I write this !!) and when playing live – great improvisational skills. The backing vocalist and fiddle player Colleen Trenwith also does a fine job of enhancing several tracks. If readers get to see the band playing live it is a well worth experience and if you’ve bought the CD first you’ll be able to sing along like me ! Who do the Cattlestops remind me of ? ….Well they have their own unique sound, but I think they remind me a bit of the Little River Band ,Crosby Stills and Nash (with less harmony ) and maybe America or the Byrds or am I just including some of my fave bands of the 70’s !! Um – I’ll have to think about this for a while. I suppose they (Cattlestops )are a country ,bluesy ,folky mix. If we still had “the top ten” I’m sure several of these / your songs would feature. My personal favourites are Dancing in the Rain, Me and My Girl, Every time I think of You , Martinborough Morning and Kapiti Sunsets. Well actually I like them all !